We spent over 36 hours researching and testing 20 different types of cake pans and found that material of the cake pan, performance, and ease of clean up were most important. The Nordic Ware Cake Pan scored high marks in every category and is our top pick. The design of this cake pan enables you to cook beautiful Bundt cakes that add style and elegance to your dining room table. The pan is made from cast aluminum and provides excellent results. This cake pan has a 10 cup capacity and the non-stick coating is easy to keep clean and in great shape. Baking cakes is a very popular activity for many people and it’s no wonder with cake being a popular favorite food. It doesn’t matter whether you are a professional baker or a non-professional, when you decide to bake a cake; you want to have the right cake pan or pans for the job. Today’s cake pans offer tons of variety and options. A good cake pan or set of cake pans is a great way to love baking. There’s not much more enjoyable than baking with brand new, good quality cake pans. When you start shopping, you will want to consider a few things that will ensure that you get the best quality cake pans you can. Factors such as the material used to make the pan, the shape of the pan, the brand name the cake pans come from, the quality of the nonstick coating and the comments that customers have made about the cakes pans you are considering. Choosing a great set of cake pans doesn’t have to be complicated or confusing. With the right information you will be able to choose cake pans that will provide everything you are looking for. This beautifully designed Bundt cake pan will produce a cake that adds style and elegance to your table. Friends and family alike will be impressed with the look of this cake. The swirl design looks fantastic with or without icing. 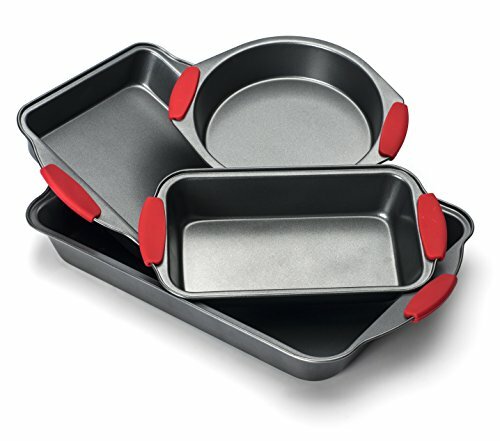 The original cast aluminum bake ware provides the baker with superior results and performance. The non-stick interior makes for quick release of the cakes and super easy cleanup as well. The heat reflective exterior in silver platinum makes sure that your cakes brown uniformly. It has a 10 cup capacity to produce a good sized cake with gorgeous detail. This unique cake pan is made in the USA by Nordic Ware. It cleans up easily with hand washing and mild detergent and comes with a limited lifetime warranty. This 4 piece nonstick cake pan set has silicone handles and a nonstick surface on all three pans. The superior nonstick coating that these pans have, have the easy release technology that makes cakes just slide right out when the pan is turned over. The wide, round ends have silicone grips that make handling them super simple. Each pan is made with heavy duty commercial grade steel that produces professional results and will last a lifetime. Each cake pan is 9” in diameter and is 1.5” deep. These cake pans are perfect for any type of cake and they are guaranteed not to rust or warp. You’ll have them for a long time to come with proper care. One of the big differences about these Elite Bakeware Cake Pans are the silicone handles. Regular cake pans can be difficult to pick up straight out of the oven, but these silicone handles takes care of that problem and makes them much easier to grab, right out of the oven. They are oven safe up to 475 degrees. All three of these cake pans are backed by a lifetime guarantee with no catches, hassles or questions. T-fal has created an excellent cake pan that will produce the perfect cake time and time again. The Airbake Natural Cake Pan produces the best baking results every time you bake with it. It is made from 100% aluminum that produces an overall better baking performance. The insulated aluminum sheets and microdome technology decreases bake times by as much as 15% compared to traditional insulated bakeware. This cake pan is created by two heavy duty aluminum sheets that surround a layer of air. The air present reduces the temperature of the part of the cake pan that comes in contact with the food you are baking. The bottom sheet works to block the oven heat and the air insulates everything, preventing the top sheet of the cake pan from overheating. This unique construction means no burning, moister results and better browning as well. This cake pan measures 13 x 9 and comes with a lid. It is recommended that plastic utensils only are used on this cake pan. The nonstick coating may darken over time which is completely normal. 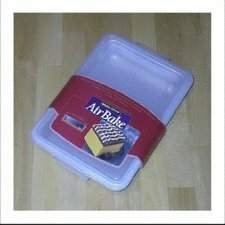 The Airbake cake pan is dishwasher safe but it is not advised to use the dishwasher detergent tabs. Never soak this cake pan as water could get inside. If there ever is water between the two sheets place the pan upside down in the over, set at 250 degrees for 30 minutes or until the water is gone. This pan is rust proof and comes with a lifetime warranty. When it comes to bakeware, finding high quality products that produce excellent results is important. Not all cake pans are created equal and there is definitely a difference between high quality cake pans and those that do not hold up well to regular use. A good quality cake pan will produce a perfectly browned, evenly cooked cake every time with no sticking. All three of these cake pan products featured above are high quality pans that any baker, professional or not, will love using. Each of them is constructed from quality materials with nonstick surfaces that are guaranteed to last a lifetime with proper care. If none of these cake pans are what you are looking for, continue reading our buyer’s guide for more information on choosing the right cake pans for your baking tasks. The right information will help you confidently choose the right pans for your needs. What is a Cake Pan? There are a lot of things that go into baking an excellent cake. The flavor of the cake you want, the ingredients needed, and the frosting you will be using. One of the most important factors to consider is the cake pan that you will use to bake your cakes. Your cake pan will determine how the cakes turn out, so it is critical that you choose one that is high quality. There are many different types of materials that a cake pan can be made of. They come in many different shapes and sizes as well. It’s crucial that you select the right type of cake pan so your cakes come out perfect every time. Cake pans are typically made from three types of materials: stainless steel, aluminum and silicone. Each of these materials has their advantages and disadvantages. Most bakers will have a favorite type of material that they prefer and always use to bake with. We’ve outlined the differences below. Stainless Steel – Bakers that use stainless steel typically love its durability and resistance to staining. Many feel that stainless steel doesn’t bake cakes as evenly as other materials due to the fact that it doesn’t conduct heat as well. Aluminum – Aluminum pans have a lot of loyal fans as well. It conducts heat very well and creates an even surface that produces evenly cooked cakes every time. Silicone – Silicone is very easy to store and keep clean. It is a versatile and durable material that has gained a ton of popularity and recognition over the last few years. Silicone cake pans can go from freezer to fridge to microwave and oven with ease. They do not stain or rust and will last a lifetime. There are some that feel silicone doesn’t brown the cakes as well as aluminum does and that the cakes can be damaged easily if care is not taken to stabilize the pans when taking them out of the oven or moving them. There are several different types of cake pan shapes on the market. They are used for different types of cakes but all of them have one thing in common which is to produce excellent cakes that people can enjoy. Round – Round cake pans are used in making layer cakes. There are many different sizes of round cake pans. They are good for baking cakes that can be stacked. They are also used for creating pieces for sculpted cakes. Rectangular – Sheet cakes are made in rectangular pans. They are much easier to transport than layer cakes are. The flat and larger surface of a sheet cake makes a good foundation for fun and unique designs. Sheet cake pans are used to bake large cakes for large gatherings. Square – square cake pans are not as prevalent as round and rectangular but they are still sometimes used if the baker wants a layer cake that is not the traditional round shape. Springform – A springform cake pan is a cake pan that has removable sides. These are usually used for cheesecakes, and other types of cake that may be more difficult to remove from the pan. They are also good for coffee cake. Specialty – Specialty cake pans can span many different styles from well know characters like Hello Kitty and Mickey Mouse to different shapes like a star or heart. People, who bake cakes for a living, usually have a lot of specialty cake pans so they can offer their clients plenty of variety and choices. Not all cake pans have the same oven safe temperature ratings. Most cake pans are oven safe up to 450 degrees. There are some; however that can handle 500 and even 550 degrees. Nonstick surfaces are good for getting cakes out of the pans without sticking. Low quality nonstick has a bad fail rate, but if you purchase high quality nonstick cake pans and take care when washing them, you will have a much easier time getting your cakes to release without problems. Many people still use flour inside a nonstick cake pan to ensure that there is no chance of the cake sticking and getting ruined. Springform pans are excellent for easy release of the cakes you are baking. They have removable sides that can help you release even the most delicate type of cake without cracking it, breaking it or ruining it in some way. Many wedding cake bakers use springform cake pans to bake the largest layers of wedding cake since they are difficult to get out of pans safely. Homemade cakes are a favorite dessert and treat of many people. To bake the perfect cake, you need to have the right tools and that includes high quality cake pans. The three top rated cake pans we reviewed above are good examples of high quality cake baking tools. There are others that are good as well but you need to do your research before spending your money on them. If you focus on quality materials, price, shape of the pan and the reputation of the brand as well as what customers are saying about them, you will be well on your way to purchasing the kind of cake pans that will enable you to produce high quality and well made cakes time and time again. The type of cakes you bake will determine the shape and type of cake pan that will be best, but the basics are the same. Look for high quality materials, good brand names and check the reviews and comments from customers to get information on how they are performing in real world situations.